Blacktown Hospital educated administration staff on the importance of maintaining accurate contact details in patient records. It also displayed signage in the emergency department (ED) to remind families and carers to include their contact details on the patient’s admission form. To ensure 100% of all administration staff identify and register the correct details of the carer, contact person or person responsible for patients, by December 2016. Improves the accuracy of family and carer contact details in patient records. Ensures family and carer contact details are accessible in a timely manner. Reduces the time taken to find contact details in patients’ records. Eliminates the risk of contacting the wrong person and causing distress to the patient’s family and other people involved. Improves staff understanding of ‘person to contact’ and how to add these details in the Integrated Patient Management System (IPMS). When admitting a patient into hospital, a medical record is created that includes the contact details of the family member, carer or person responsible for the patient. This is important, as hospital staff need to contact the right person in the event of a crisis or emergency situation. This information is also used to contact the patient’s family member or carer to coordinate transfer and care arrangements when the patient is discharged from hospital. Staff will also contact the family member or carer to discuss care and treatment plans, if the patient is unable to communicate or advocate for themselves due to cognition or communication impairments. Prior to the project, there were several instances where clinical staff could not access the patient’s person to contact, or the details in the IPMS were incorrect. A staff survey conducted in 2016 asked staff whether they had experienced any issues finding the correct person to contact in the past 12 months. There were a significant number of doctors, nurses, allied health workers and ward clerks who had experienced difficulties in finding the right person to contact, as the details were either incorrect or not included in the patient’s medical record. This caused considerable loss of time for staff and patients. In some instances it caused distress after the wrong person was contacted. This issue was enhanced when electronic medical records (eMR) were introduced in 2016, as staff no longer had access to a hard copy of the patient’s medical record, which featured the ‘person to contact’ section on the front cover. A review that took place following the survey found that administration staff were either adding contact information to areas that were inaccessible to clinical staff, or were not checking the information to see if the person to contact had changed since the patient’s last visit. A multidisciplinary working party was formed to improve the accuracy of entries in IPMS. It was determined that better education for staff would address the issue in the first instance. Face-to-face workshops were held for administration staff, to educate them on the importance of entering ‘person to contact’ details correctly and how to do this in IPMS. Education for new staff was implemented in the IPMS search and registration training component of the induction process. Signage was displayed in ED waiting areas, to remind families and carers to provide their contact details to the hospital when admitting a patient. 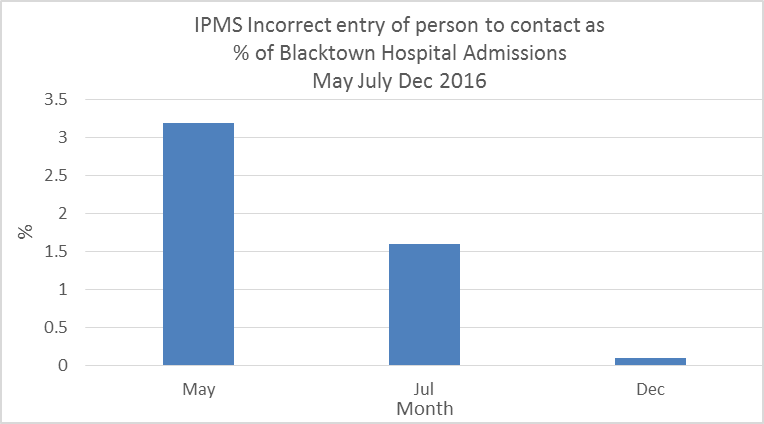 An audit of IPMS reports in January 2017 found the total number of incorrect ‘person to contact’ entries had reduced by 77% since September 2016. The rate of incorrect ‘person to contact’ entries as a proportion of total hospital admissions reduced from 3.1% in September 2016 to 0.1% in January 2017. Staff surveys conducted prior to and following education workshops in October 2016 found that administration staff improved their understanding of ‘person to contact’, with 90% stating they understood how to add these details correctly in IPMS. 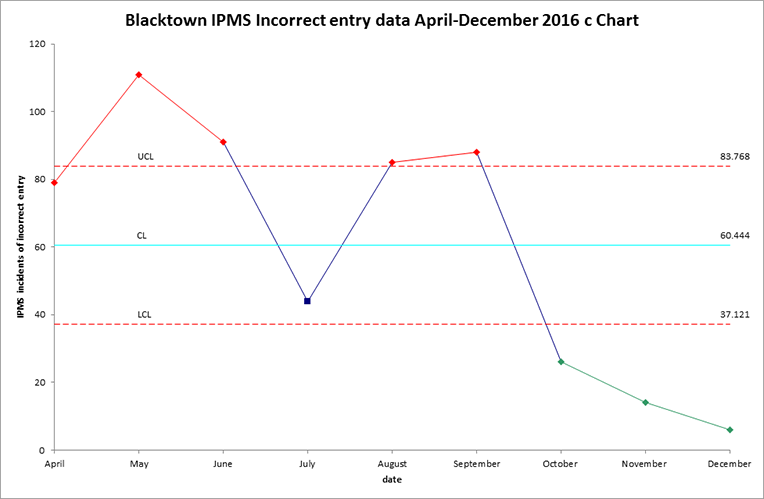 On reflection, the aim of the project should have been worded with greater clarity and read 'By December 2016 correct details of the carer, contact person or person responsible for patients are entered or updated in IPMS for all patients engaging with Blacktown Hospital'. Using data was a great way to pinpoint departments that were not entering ‘person to contact’ correctly and had not sent staff to attend workshops. These departments were provided with follow-up in-service training. Getting the right people to attend education workshops is more important than getting everybody to attend.